Name a team sport that is athletic, gymnastic, acrobatic, artistic and highly competitive. If you guessed “Cheerleading” you are correct. 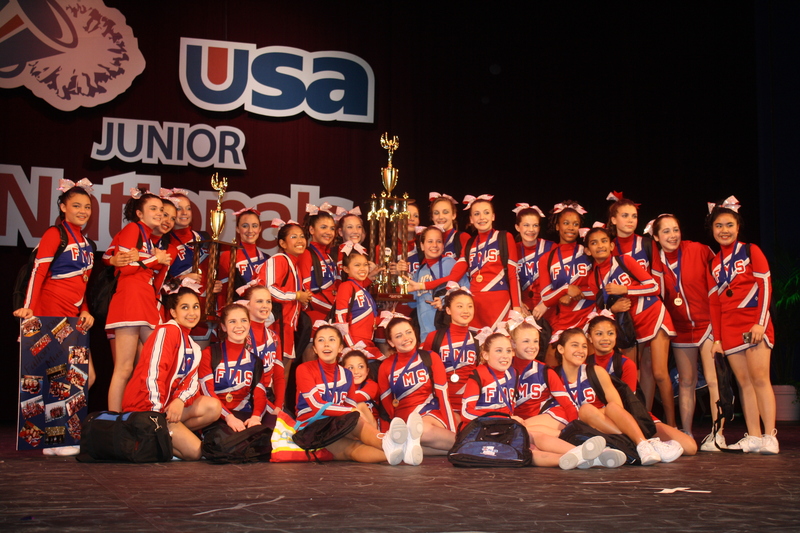 Fallon School’s Competition Cheer Team was recently named the United Spirit Association’s Jr. Nationals Grand Champion for 2010. The Grand Champion is the school-based cheer team with the highest score of the competition. 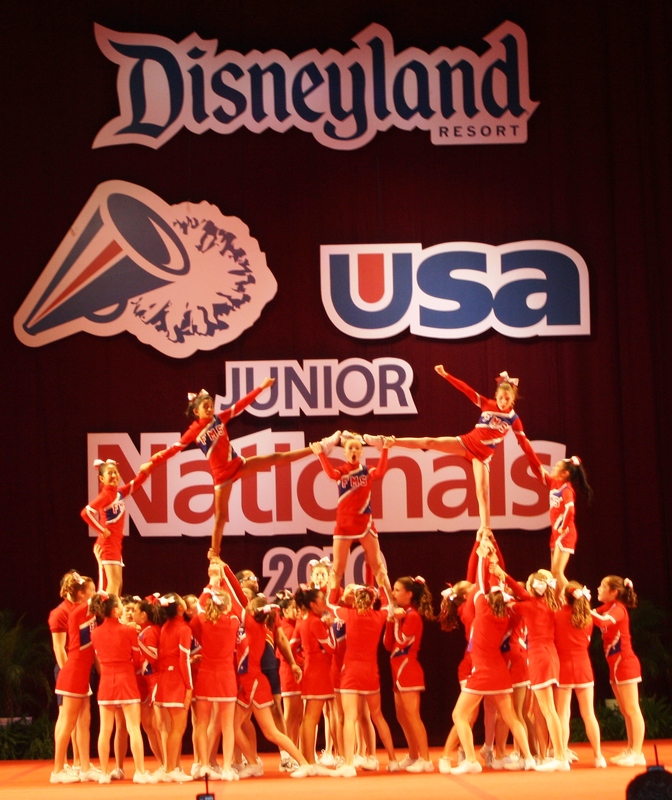 The USA Jr. Nationals competition was held at Disneyland in February of this year. 50 Fallon Middle-schoolers participate in the Fallon Cheerleading program which includes both a Spirit Squad and a Competition Team. The Fallon Cheerleading program has grown from 19 to 50 students in just a few years under the leadership of coach (and parent) Kristine Cousins, supported by the tireless efforts of parents Christina Brown and Colleen Carrion plus the entire Fallon Cheerleading extended family. Ms. Cousins was recently selected as coach of Dublin High School cheerleading program that will be expanded to include a Competition Team. Ms. Cousins believes every student that wants to participate should be given a chance. Unlike the “Cheerios” of Glee fame, the Fallon Cheer Program is inclusive. There are two levels – the Spirit Squad and the Competition Team. Instead of traditional tryouts, Ms. Cousins evaluates students individually for readiness to participate in the more physically demanding Competition Team. Given the enthusiasm on display whenever Fallon Cheer is performing, the program is working. Ms. Cousins was nominated for the City of Dublin Citizen of the Year award in 2010 for her efforts developing the Fallon Cheer program. The Fallon Cheerleading Program has been a positive experience not just for the participating students, but also for the parents who travel from competition to competition in support of their team. And these Fallon parents are not just idle bystanders but active cheering participants themselves (frequently decorated with Fallon Cheer gear). Ms. Cousins will be bringing the Fallon Cheer program to Dublin High School for the 2010-11 school year. As is the case at Fallon, all grade 9-12 students (boys and girls) interested in cheerleading will be accepted into the Spirit Squad (tryouts will apply for the Competition Team). With such a strong program at Fallon in place, Dublin High Cheerleading has many good years ahead. In addition to her extensive efforts to enrich Dublin public schools, Ms. Cousins owns and operates Soul Sisters Spa.